Optimizing with Tim: 0% to 2.82% conversion in 3 short emails! This is a guest post from a business friend named Tim Perry. He’s much smarter than I am. He managed to improve his conversion rate from nothing to 2.82% within 3 emails with his knowledge of conversion optimization. In this feature article he shares his exact thought process, his funnel graphs, and the fixes he made to supercharge his campaign. 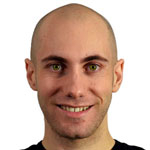 To build his profile as a recording studio designer, Tim decided to expand his services globally by building an online reputation. Tim was able to build his email list to 2000 subscribers by offering free blueprints for do-it-yourself sound diffusers, which are a type of acoustic panel that scatters sound. Acoustical engineers use these in music rooms, recording studios and concert halls to modify how sound behaves when it bounces around in the room. He started offering acoustic consulting services by tapping into his background in audio engineering and acoustics. As his list of subscribers grew, he gained more and more opportunities to design music studios and show producers and recording engineers how to apply acoustic treatment in their rooms. Tim first warmed up his list of subscribers by giving them some new free acoustic treatment blueprints. A week later, he started pitching his consultancy service, offering to enhance their room acoustics (show them how to soundproof a room and where to place acoustic panels). I’ve been using a great free app called Streak (http://www.streak.com/) which gives you a CRM / sales funnel right in Gmail. I’ve been using it to keep track of leads and prospects, track where they are in the sales funnel, and to schedule emails that I want sent at a specific time. Following are the 3 reports Streak generated for me. 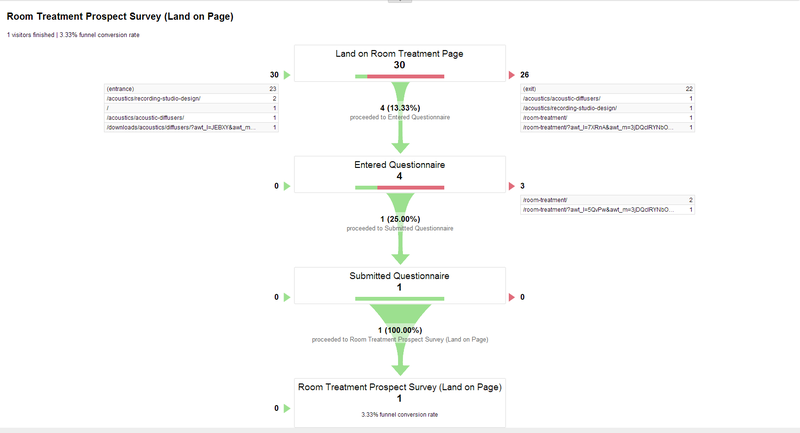 This first image shows the long funnel that initially required them to enter their email before seeing the landing page. As you can see, some people indicated interest by entering their email address, but not many people actually made it to the landing page. This test was run on 307 people not from the USA, as it was the week of July 4th and I did not want to pitch Americans during that time. And no one from that batch completed their project submission, probably because the survey required them to have a budget. Next, I pitched 158 Americans, sending them directly to the landing page. Unfortunately, at this point the landing page did not perform well because the CTA button still said “Submit Your Project” rather than “Get a Free Quote”. I changed it to “Get a Free Quote” after most of the people had already seen the page. The project submission conversion rate for this email was only 1/158*100 = 0.6% according to the image (actually it was 1.2%, as the next day, after I changed the CTA button, another person who did not open the email the first day, opened the email the second day and applied). The landing page itself only has a conversion rate of 2/191*100 = 1.05%. (the funnel makes it look like it’s 0.52%, but that just means that one of the people who submitted the survey did not complete the Aweber confirmation. In fact, they did continue to converse with me and we are now discussing their project). This is the stats for the final email I sent to 425 people, which contained a direct link to the survey and the CTA “Click Here for a Free Quote”. Of those 425 people I sent it to, 8 completed the survey and many more emailed me back, resulting in 12 new prospects on the path to becoming clients. 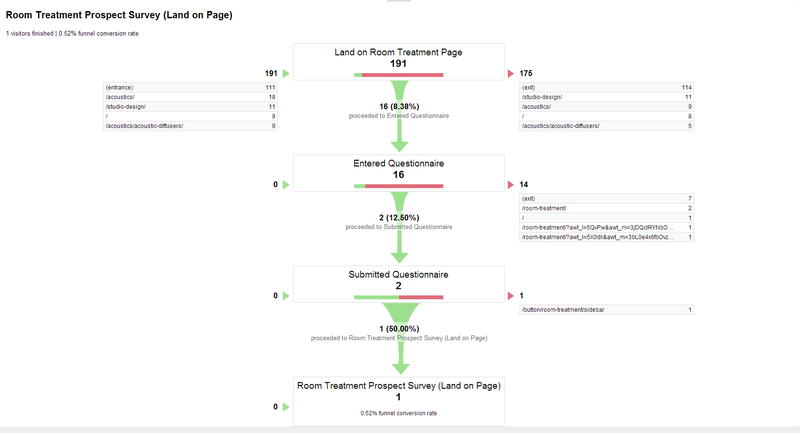 So, the project submission conversion rate for this mini-funnel is 12/425*100 = 2.82%. I also gained a couple other prospects through individualized, targeted emails. I simplified the application process by removing the first step from the funnel all together (the part where they enter their email address and ask for more info). Instead, I sent them directly to the sales page. I originally had this first step (where they enter their email to request more info) because it was an easy way for them to express interest without having to do a full survey. 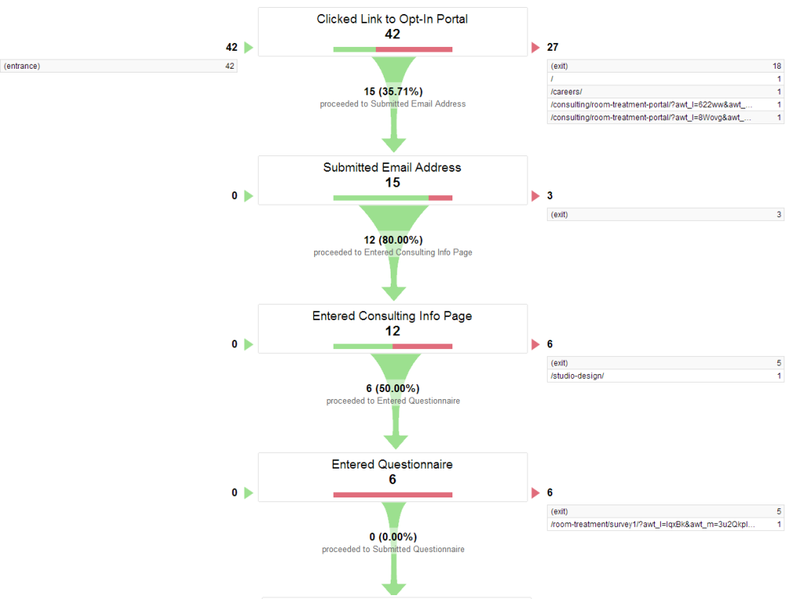 This partly worked as intended, BUT, while lots of people did enter their email address, no one actually followed through and made it to the end of the funnel! So I removed that step and instead sent people straight to the sales page. This is a big one… most people who entered the sales page were not entering the survey, so I changed the call to action on a button that leads to the survey. It used to say “Submit My Project”. 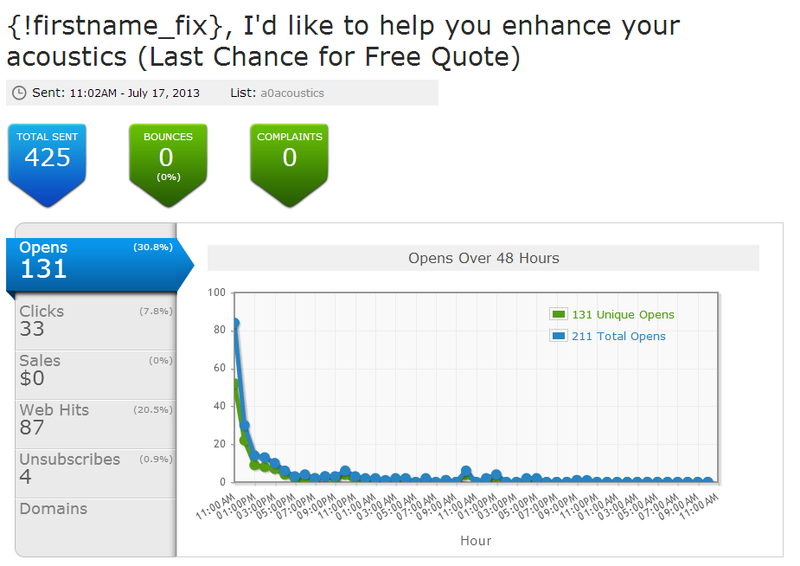 I changed it to “Get a Free Quote”, which the data indicates is much more enticing for people to click. I changed the survey, so that entering a budget is optional, not mandatory. People were quitting the survey half way through because it required that they give their budget, and I expect that requires a lot of work for them to figure out. In my final email, I removed all major point of resistance by straight up offering people a free quote and linking directly to the survey. This one email got me over a dozen interested prospects who requested quotes (prior to that, only 2 people who were good prospects). I learned that to get lots people to act, you need to make an offer that’s irresistible 🙂 (in this case, the offer of a free quote) and streamline the application process (remove unnecessary steps that cause resistance). I now have 17 prospects I’m filtering through and negotiating with. I also learned that (in this case) it was more effective to convert customers through email than to rely on my sales page. Way more people completed the survey by clicking a direct link to the survey in the email, versus by clicking a link that leads to the sales page (the goal of the sales page is to get people to complete the survey, but it does not do a great job of this). So, for high value clients, 95% of the selling is best done through building a relationship via email. The sales page important too, but it’s the icing on the cake. Right now, my sales page on its own is not very effective. Tim is an acoustical consultant who provides music studio design services.